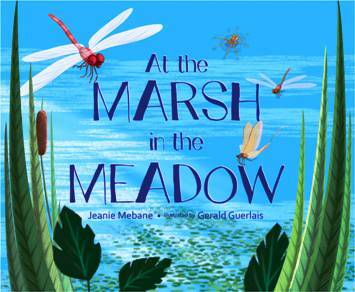 Some of our biggest lessons can be learned right out in the middle of nowhere, and this fact is proven in a brand new picture book called At the Marsh in the Meadow, by Jeanie Mebane. In the spirit of that clever and catchy tune called “The House that Jack Built,” readers learn all about how everything in the marsh depends on each other and ends up right where they began as the circle of life continues. The opening page is a serene view of the lovely marsh in the middle of the lush and quiet meadow. Then readers take a dive to the marsh bottom and visit the mucky mud that grows the reeds that coexist among the tiny algae that feeds the mayflies that are eaten by water spiders that…well, you get the picture. Readers get to examine every ladder of the food chain, including dragon flies that eat the water spiders and minnows that eat the dragon flies and tadpoles that eat the minnows…and a bevy of other living things that depend on other living things to keep the circle of life going. Young ecologists, emerging scientists or kids who simply love a good backyard adventure will delight in the rich illustrations of nature. There is shimmering water brimming with fish and tadpoles, blue skies full of mayflies and dragonflies, single-minded minnows racing toward their next meal, and other assorted insects, fish , and even eagles racing toward theirs. This is a quiet book that artfully deals with life and even death, but does it in a way that helps the reader understand that both fit neatly into the circle of life. It should do well in an early science class, as a reinforcement for an ecology lesson, or as independent reading for burgeoning nature lovers.